One more day. One. And now that the day is practically here, I am so excited. So happy. Beyond happy! Here is the last teaser of our wedding weekend, highlighting the festivities we will have tonight to kick off our celebration of love! 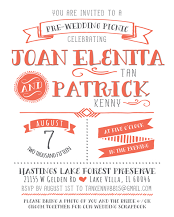 I had picnic invitations created through an Etsy shop, Simply Smitten Designs. They did a beautiful job designing and printing the invites, which I've already received in the mail. 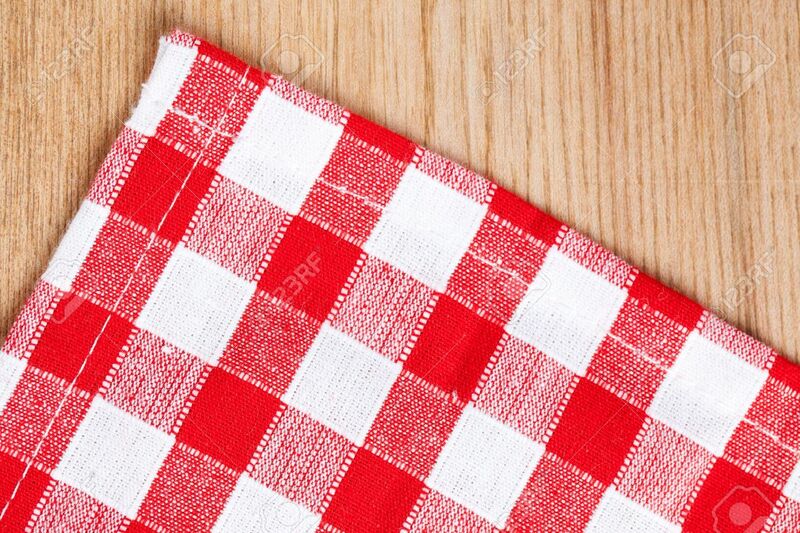 Each of the picnic tables at the venue will be dressed with the classic red checkered picnic tablecloth . To me, this iconic look is what picnics are all about! To add some color to the tables, I also used mason jars as vases for some fresh flowers I picked up. The flowers will also be used tomorrow in our ceremony, where we will create a 'flower circle' under the tree where we will be wed.
Each table will also have a framed I SPY game for guests to play. They are asked to take a picture of various unique items incorporated into our wedding that they can share on social media using our hashtag #tankennylove. Pimento Cheese & Crackers. 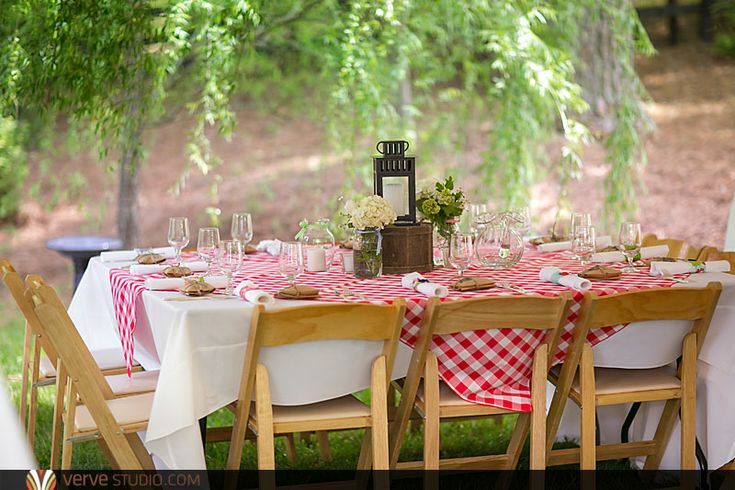 I'm making this for the wedding and knew a proper Southern picnic should have some homemade pimento cheese on the table. Deviled Eggs. I ordered this to be catered so that I wouldn't have to go through several dozens of eggs and boil, cut and fill them myself. These are a great appetizer to have for a picnic and a perfect addition to the table. Dip & Veggies. I also ordered this to be catered and it includes a spinach dip served with a variety of veggies. Colorful, healthy and another cool summer appetizer to share. Smoked BBQ baby back ribs from our favorite rib joint, BBQ Productions. They are a local spot known for their ribs and we've ordered quite a few slabs for our hungry crowd. To accompany the ribs, we will also have a BBQ sauce bar which includes several bottles of different sauces for guests to dress them as they wish with Maple Chipotle Sauce, IBC Rootbeer Sauce, Sam Adams Boston Lager Sauce, Alabama White Sauce and a Chicago Sweet & Spicy Sauce. Macaroni & Cheese from Popeyes. A favorite of Joel's, this mac and cheese is a great vegetarian option and a classic dish everyone loves! Buttermilk Biscuits Bar with biscuits from Popeyes. If you know me and how I host parties, I love menus where guests can help themselves to play and customize their food. Rather than throwing biscuits on the table, I've included a variety of jams, jellies, honey, butter and spreads for their biscuits. 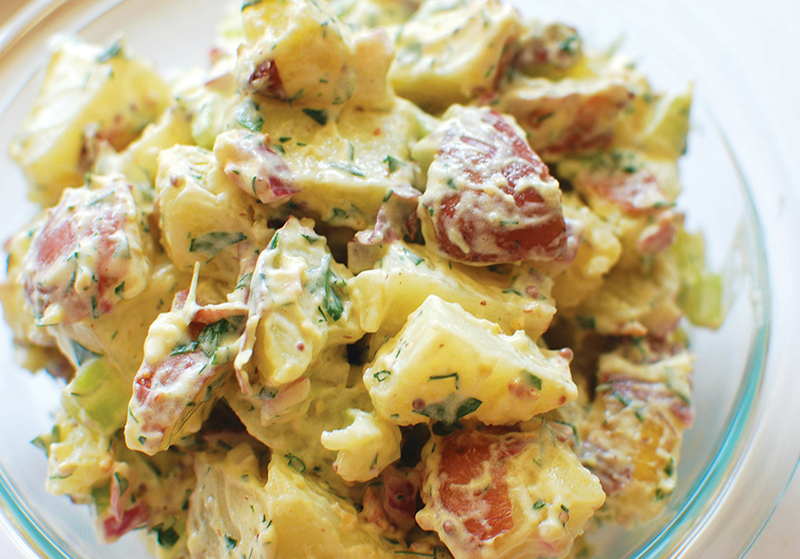 Southern Potato Salad. I'm marrying an Irish guy so there has to be some potatoes represented lol. That and its a perfect accompaniment to fried chicken too! 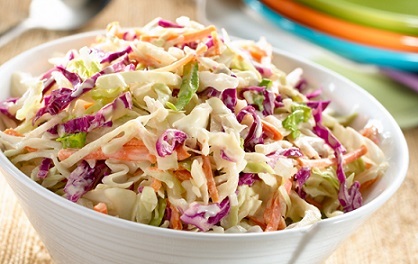 Tangy Coleslaw. Another side dish for our fried chicken and ribs and a classic picnic staple. This beats a typical green salad any day. 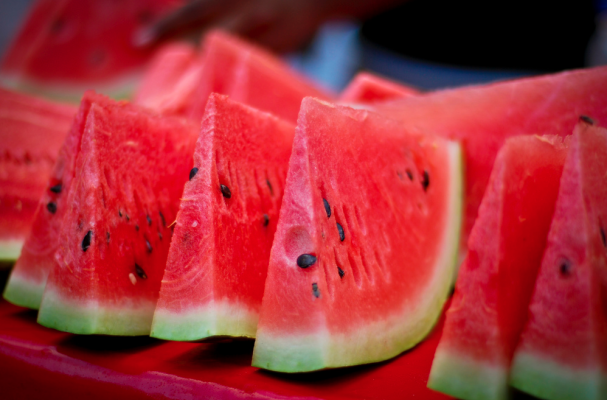 Fresh Cut Watermelon. It's summer, so why not? I bought a few seedless watermelons to cut up and serve on a galvanized tray that will be set on a dessert table. Salted Caramel Shortbread. I picked up a couple containers of these and added them to our dessert table at the last minute because I started thinking there may not be enough food. Typical lol. Picnic Pie Buffet with pies from Bakers Square. It's not unusual for Patrick's family to celebrate birthdays with a pie instead of a cake, so we're highlighting pie as our main dessert for the picnic. We're going to set up a pie buffet (something we are both super excited about!) I'm using cake stands from my personal collection to display the pies in varying heights. Sweet Tea & Lemonade Station. I have 3 beverage dispensers set aside on a table that will be filled with sweet tea, lemonade and also watermelon punch. In addition, we'll have Coca-Cola products, bottled water and beer for guests to quench their thirst! And for an extra touch, I'll also have a mason jar filled with fresh mint from my garden to add a nice garnish to drinks! So with a venue set in a forest preserve on a summer evening, there will definitely be some unwanted visitors - mosquitos. That said, I wasn't sure if the county fogs off insects so I purchased some bug fogger to treat our venue. Repel Lemon Eucalyptus. And for added protection for our guests, I also purchased several bottles of deet-free insect repellent. It's the little things, you know?! I knew I had to incorporate some fun entertainment. Among my friends, karaoke is a favorite pastime and we had to incorporate karaoke somehow in our wedding festivities. The best opportunity is going to be at our picnic since it's casual, fun and a time for folks to really belt out their favorite song. We've hired a karaoke DJ to come out and liven up the mood with some songs and a few microphones for friends and family to sing their hearts out. I personally can't wait to hear my friends sing and liven up the party! And as sunset comes around, Patrick and I will be saying goodnight before our big day tomorrow. He will be staying at a local hotel while I will go back home and try to sleep with all the excitement. 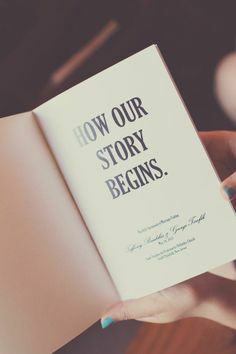 I have an early day tomorrow with our hair and make up stylists... and I'm ready to be glammed up for my dream wedding to my dream man. 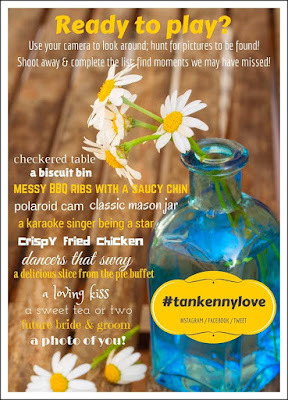 Thank you for allowing me to share my whole wedding planning process all this week and if you're on social media, you can follow along the #tankennylove hashtag for pictures of the entire weekend festivities! Oh my gosh, this is going to be the cutest pre-wedding event ever! I love the southern theme and it's totally spot on! Congratulations!! !